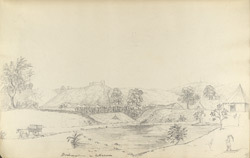 Pencil drawing of a village in Kathiawar by George Boyd (1800-1850) dated between 1821 and 1844. This is one of 95 drawings (90 folios), chiefly of landscapes and monuments in the Deccan, West India and Afghanistan made during this period. Boyd served in the Bombay Infantry from 1820 to 1850 and was chiefly employed in survey work. From 1822 to 1831 he was in the Deccan and Satara; in 1835 he was on survey in Kathiawar; and in 1839 he was making road surveys in Sind. He was mentioned in dispatches during the war in Afghanistan in 1840 and in 1842 he worked on a survey between Quetta and Kalat. Kathiawar is a peninsula in Gujarat state, west-central India. It is bounded to the north by the great wetland of Rann of Kutch, to the west by the Gulf of Kutch and to the south by the Arabian Sea. The area has a rich heritage of Hindu, Jain and Muslim buildings. European nations established factories and trading bases around the coast from the fifteenth century onwards. Kathiawar was never absorbed into the British Empire but was fragmented into over 200 petty states ruled by princelings. Upon Independence in 1947 the princely states of Kathiawar were grouped together to form Saurashtra.